I left work at about lunchtime, collected Kerry-Anne from home and headed into Cape Town to join thousands of football fans at the V&A Waterfront to watch the 2010 Football World Cup opening ceremony. The Waterfront was alive with people excitedly preparing to watch the ceremony and first match. We watched the ceremony at the amphitheatre, very proudly reflecting on what our little country at the tip of the large African continent has achieved in so little time. I don't think any of us really comprehend the amount of effort, planning and expertise that went into organising every detail of this event. From the stadiums and the roadworks to the planning of dance routines, coaching of kids, and preparing to receive thousands of foreign visitors... it's all been executed pretty darn awesomely! From our restaurant table at Wang Thai, Kerry-Anne and I proudly watched our team, Bafana Bafana (ranked 83rd in the world), play a great game against Mexico (ranked 17th), drawing 1-1 after 93 minutes. 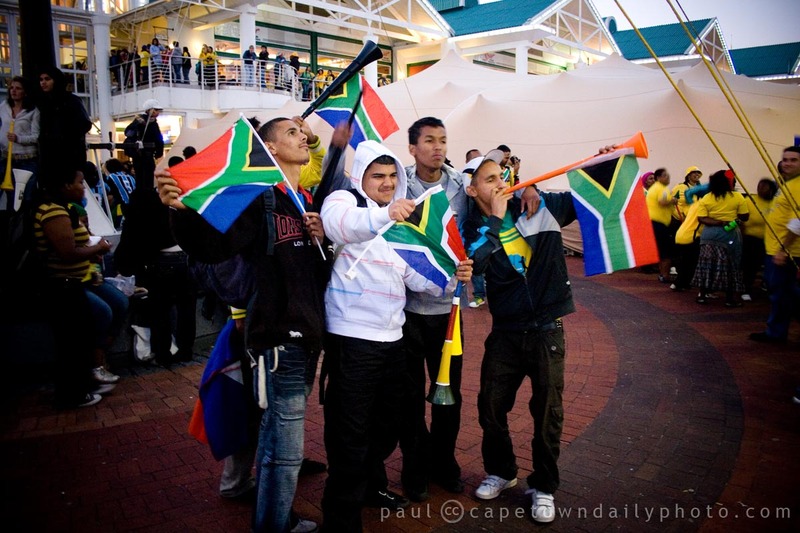 We left the packed restaurant after the match, had some coffee at a nearby coffee shop, and then slowly walked over to the Cape Town Stadium for the match between France and Uruguay. This was the first time that we'd visited the stadium, and I have to say to the team who put it together: wow, you did good! I didn't realise that a stadium could be so beautiful! Posted in Street photography and tagged 2010 world cup, people, sport, v&a waterfront on Saturday, 12 June, 2010 by Paul. Always enjoy watching Cape Town. Especially enjoying your posts when South Africa is at the center of sports news. Paul: I am taking lessons from my football-crazy sons. Great article, brings back the memories.